Look no further than Steak-Ranch Kabobs for a twist on barbecue. 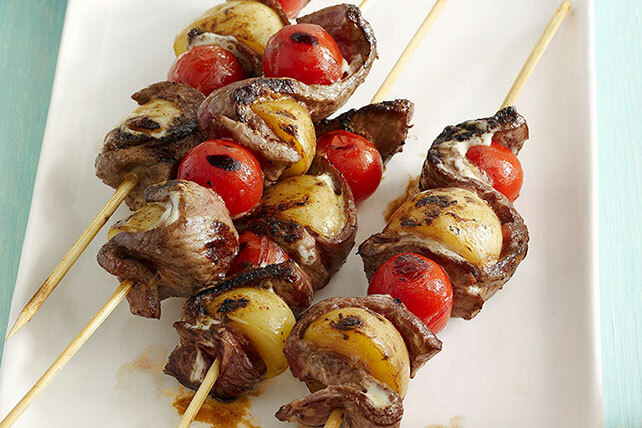 The ranch dressing in Steak-Ranch Kabobs is perfect with the meat and cherry tomatoes. Cook potatoes in boiling water 12 to 14 min. or until tender; drain. Cool slightly. Reserve half the dressing. Thread meat, accordion-style, onto 4 skewers, alternating potatoes and tomatoes between folds of meat; brush with remaining dressing. Grill 10 to 12 min. or until meat is done, turning occasionally and brushing with the reserved dressing for the last 2 min. Substitute fresh mushrooms for the potatoes. Soak wooden skewers in water for 30 min. before adding kabob ingredients to prevent charring. Prepare using KRAFT Fat Free Ranch Dressing.